And you would be right. 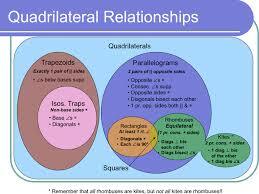 What learners struggle with it the relationships between the different quadrilaterals. A square has all the characteristics of a rectangle and can, therefore, be called a sub-group of rectangles. But not all rectangles are squares. I have tried to explain this is multiple ways. Some years I try a tree diagram to show the relationships. And other years we try Venn diagrams. Even after a course on Feuerstein’s teaching methods I just could not make learners click what is going on here. This year I decided not to teach quadrilaterals to my grade 10’s. I have after all done it the previous 2 years. I asked them to make a summary of all the characteristics from memory (with a little help from google). This fitted with my aim of not telling them something that they just as easily find for themselves. The next lesson we did a Kahoot called, Always, sometimes, never, which I adapted from a public Kahoot by kimblejl. The first few questions completely confused them. After each question, I would take a moment to explain why the answer is what it is. They quickly caught what was going on. Even though they still did not find it easy, they got better and better at decided what is a subgroup of what. Only after we completed the Kahoot did we set up the tree diagram. For the first time since I have been teaching this, did I feel that the kids were with me and understood what I was doing? 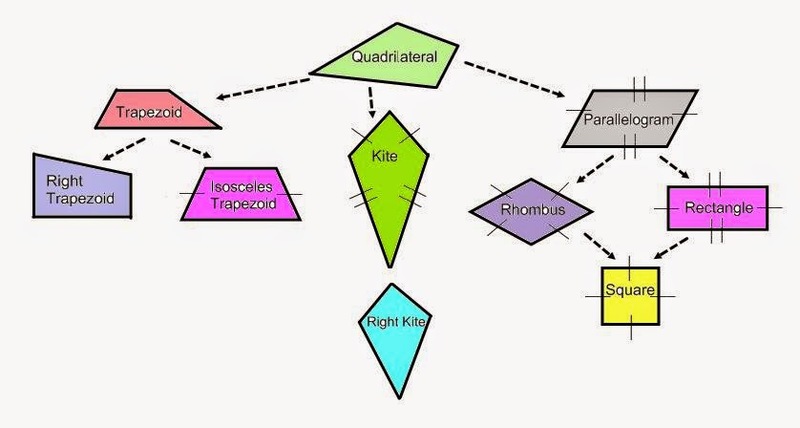 but not all quadrilaterals are kites. and asked them to create another 3 pairs of statements. In none of my previous classes did I even asked them to do this, because they did not understand what I was trying to do. After completing the Kahoot, every learner in the class managed to do it. Do they know the characteristics of quadrilaterals of the tips of their fingers? No, not yet. Do they understand that some quadrilaterals are subgroups of others? Yes, they do. The best part of this lesson was that I did not spend hours preparing it. To be honest it was a very busy few day and I made most of it up as I went on. Instead of looking up the characteristics myself and teaching them, they looked it up. All I had to do was give them hints as to what I was looking for. The Kahoot I adapted from a pre-existing one. All I had to do was change a few terms to fit the terminology we use in South Africa. This just shows that although it often takes a lot of prep to incorporate technology in your lesson. It doesn’t have to.